↑ 2.0 2.1 Sir Edward Belcher. Narrative of the voyage of H.M.S.(1848)p.318. There were no traces of inhabitants or visitors"、"Traces of the wreck of Chinese or Japanese junks were noticed. ↑ Unryu Suganuma (2000). 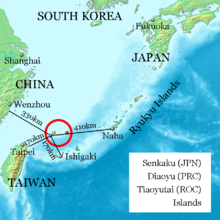 Sovereign Rights and Territorial Space in Sino-Japanese Relations. University of Hawaii Press. 第 95頁. ISBN 0824824938. ↑ "『地学雑誌』第140巻" (用日文寫). （原先內容喺2013年9月27號歸檔）. 喺2014年6月2號搵到.